Ladies and gentleman, allow me to introduce you to a promising new up'n'coming talent in Matt Mariner. 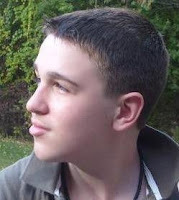 Mariner is a 16 year old Boston native, and is a singer/songwriter. He is a part of the Boston-based music development group, Bristol Entertainment, which is also currently grooming another artist poised for big success, Universal Motown Recording Artist Jada. Mariner sounds like a mini-Justin Timberlake, crossed with one of my fave "American Idol" contestants, Chris Richardson. This is in part thanks to his producer, Ric Poulin, who also works closely with the aforementioned Jada. His first single, "For The Best", is available for listens on his MySpace (myspace.com/mattmariner) and will be getting a real release on iTunes soon. It reminds me A LOT of Richardson's "All Alone", mixed with a Timbaland type production groove (and that is definitely a good thing). What I like most about Matt is that he really uses all of the options at his disposal effectively. He is a force on MySpace, communicates with fans, and already has created a fanbase willing to create street teams. >>Can you describe your musical style? Matt: It's pop/rock music mixed with a little hip-hop that would fit in on any top 40 radio station. >>You are credited as writing your own music. Where do you get your inspiration from, and what's your writing process like? I take inspiration from everyone and everything in my life. I use a method that I was taught by producer, Ric Poulin, which helps me easily transform my random song ideas into great song lyrics. I'm not great at writing melodies - lyrics are where I shine, lol. >>You're so young! When did you get started officially, and how did you come upon that decision? I've been singing and performing for as long as I can remember. I started taking acting classes when I was 8, then got an agent two years later. But I really started to focus on my music when I was 13. >>How did your partnership with Bristol happen? Well, first I was promoting my demos and one of my cousins told me about Bristol. And then about a year later, another music artist told me about them. I ended up friend requesting them on MySpace and before I knew it I was part of their artist development program. Lol. >>How did "For The Best" come about? What was it's inspiration? Is it based on a real situation? Yes, it is based on a situation in my life. It's about being nervous when confessing feelings of affection to someone, which is something I think most people can relate to... haha. >>Do you play any instruments? I play a little piano, but I'm still a beginner. LOL. >>Of all of the songs you've recorded so far, what is your favorite? I actually have a new one I'm writing called "Without You," that I'm hopefully recording soon. It's a really powerful song - definitely my favorite. >>On your MySpace, you list a lot of varying influences from The Beatles, to Stevie Wonder to Modest Mouse. I'm a super huge Stevie fan. What's your fave Stevie song? Haha - I'm probably going to have to go with "Superstition". Such a classic. >>Bristol Entertainment is also widely known for its association with Jada. Have you met the group? Are you friends? And chance for a collabo or tour together? Yes, I've met all of them. They are all very nice and down to earth. April from Jada is actually helping me stage my live show. They are very busy, so I don't know about a tour or collaboration - but that would be awesome if it were to happen! >>Is there any song on the radio right now that you've heard, fallen in love with, and wish you could have recorded for yourself? When I first heard "Leavin'" by Jesse McCartney on the radio I was like "Oh man, why couldn't I have recorded that song." LOL. >>I've heard a few people compare you style-wise and vocally to David Archuleta. How do you feel about that? He's a very talented singer, so it's definetly an honor to be compared to him vocally and style-wise. >>Are you currently preparing an album? Will there be an iTunes debut/physical release soon? YES!! "For the Best" is actually getting a physical and iTunes single release this spring. I'll hopefully be releasing an EP later this year as well. >>If you could do a duet with any female solo artist that you've never met before, who would it be? Maybe Beyonce...She's just got an incredible voice. >>What's one random little known fact about you that most people don't know? When I was younger, I used to kind of wanna be a chef. But only if I couldn't be a performer, LOL. >>What's the biggest problem in the music industry right now in your opinion? Pirating music...It's awful. I think it's really important for everyone to support artists buy actually buying music. Oh, I've given you a dardos award! haha. Visit my blog for details. Hi, This is great interview. Bristol has some of boston's greatest talent.